Can you hear their longing to understand? Yes, the disciples are concerned about the people who gather, but perhaps the question really is, Why do You teach in such a roundabout way? Can't You just tell us, straight up, what the truth is? Look at Moses, Jesus...he told the people exactly what to do, when to do it and how to do it. Simple and direct. If You are the One that the prophets spoke of, why must You speak in stories? Fair enough. But Jesus didn't answer them from the His own position: yes, He is like Moses, in that He is giving a "new" law--He is refocusing the attention away from doing the Law to having it "written on their hearts" as Jeremiah foretold. He uses Isaiah as His base of teaching operations: how the people respond is a sign of the state of their hearts. "Calloused hearts" are impervious to the truth. Just being a member of the Chosen People is not enough--this is not a club. Why "calloused?" Sin. Pure and simple. The disciples are being trained to walk with God, not just do the Law and assume He is satisfied. Jesus is trying to recreate, in the hearts of His disciples, a new law of Love--for God and for one another. So, the disciples are given the interpretation from the Author Himself. Jesus will quote Isaiah again in Matthew 15 when He says: "The Lord says: "These people come near to me with their mouth and honor me with their lips, but their hearts are far from me. Their worship of me is based on merely human rules they have been taught" (Isaiah 29:13). In other words, intimacy with the Father has been smothered under rules made up by sinful men and Jesus is reclaiming the people's hearts with His words. Sadly, the calloused condition of them is reaffirming their need for the truth. Not "a truth" from the lips of men, the The Truth"--from God's very own Son. This spiritual farm is at the center of the community's heart. The farmer here is responsible: he choose "good seed." He put it in the ground at the right time, confident in the sun and rain to bring it to fruition. Note that the danger comes while "everyone is sleeping." Hmmm....sleeping on the job? Lulled into a false slumber of righteousness? Thinking that doing the Law was enough? The enemy never sleeps...he is always on the lookout to cause havoc. Who is the enemy? Well, ultimately it is Satan, of course, whose very name means "adversary" and his other name, Devil, means "the accuser." Those names covers his operations well. But people can also, in the hardness of sin, perpetuate Satan's agenda, by leading them away from God's truth. Notice the sowing by the enemy isn't noticed until the wheat springs up. Evil starts as an idea...something that is contrary to God, unnoticed on the outside, but slowly growing and germinating in the soil of the heart. It soon springs up and may not be as obvious in the life of an individual at first. 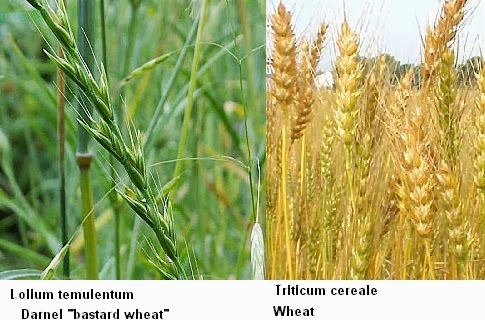 The NIV comments that the weeds are probably darnel, which looks like wheat when it is immature. It is only when the darnel sprouts its kernels that you know it is not wheat. So, notice in order to know what is truly sown by the good Farmer and what is sown by the Evil One, look at the fruit! Jesus is compassionate enough to know that the people listening to Him are not entirely responsible for their callousness...they have teachers who have furthered Satan's agenda by destroying intimacy with God with rules and regulations and their own willingness to chase after sin. Ultimately, though, Satan is behind it. With this, Jesus is reminding the disciples that God never intended for His planet to be a polluted field. The enemy gained a foothold here because Adam and Eve choose to act on an alternative plan: making their own decisions and leading lives out of step with God. So, Jesus, in effect, has come to reclaim His Father's fields. Now, let's consider what the disciples are thinking: Oh, boy! WE get to get out the scythes and start whacking that wheat! Take that, Satan! Take that, Pharisees! Take that, you sinners! NO. Jesus is not creating a new set of Pharisees. The disciples would fall prey to the same temptation to tell others how to live for God, instead of gently pointing them to the One Who will guide and strengthen their souls. The servants must serve and the angels, under the direction of the Father, will harvest. So, our job? Teach the Word in its fullness: no cherry-picking comforting verses and excluding the uncomfortable ones. Serve and love: let the Spirit convict of sin--let Him apply Round-Up to the sinner's heart. Know that God is faithful: He will accomplish His will on earth as it is in heaven. Rest in the knowledge that He will return: sin and suffering, praise God, have an expiration date.